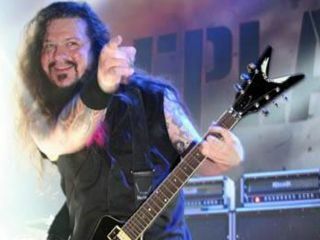 Members of Metallica, Alice in Chains and Anthrax will team up for an all-star tribute to late Pantera guitarist "Dimebag" Darrell Abbott at this year's Ozzfest. Abbott's brother, Vinnie Paul, will serve as drummer and musical director for the salute that is set to take place at the heavy metal festival on August 9 at the Pizza Hut Park in Dallas, Texas. Although Vinnie Paul came up with the idea and worked with Ozzfest organizers to make it a reality, Sharon Osbourne said it was pretty much a done-deal from the start. "When we decided on Dallas as the site for this year's Ozzfest, it seemed like the perfect opportunity to pay tribute to 'Dimebag' Darrell since it was his hometown," she said. "Dimebag was a part of our Ozzfest family and everyone in the metal community misses him dearly." At presstime, the artists confirmed to take part in the one-off jam session are Slayer's Kerry King, Alice in Chains's Jerry Cantrell and Mike Inez, King Diamond, Antrhax's Scott Ian and Charlie Benante, Metallica's Kirk Hammett, Hatebreed's Jamey Jasta, and Hellyeah's Chade Gray and Bob Zilla. The headliners for this year's Ozzfest - a stadium destination rather than a traveling tour - include Ozzy Osbourne, Metallica, Serj Tankian, Hellyeah, Jonathan Davis, Cavalera Conspiracy, Shadows Fall, Apocalyptica, and In This Moment.